Few people realize that stable blood sugar levels are one of the most important foundations of sound health. Over time, chronically high or heavily fluctuating blood sugar levels can inflict enormous hidden damage as the excess glucose combines with proteins, collagen, and enzymes, and reacts with cellular DNA. This can trigger serious negative long-term effects that can shave years or even decades off life (Cerami at al., 1987; Gillery et al., 1991). The longer that blood sugar remains out of control, the shorter your life. Insurance statistics compiled by Equitable Life Insurance indicate that 29-year-old diabetics lived 16 years less than non-diabetics, 39-year-olds lived 11 years less, and 49-year-olds lived lo years less (Goodkin, 1975). How do you balance blood sugar levels to maintain a constant supply of energy . to the cells without glucose overkill. By eating a low-glycernic,, high-fiber diet. This results in a steady stream of glucose into the blood. The best foods include rolled oats, dried apricots (which have one of the lowest percentages of sugar among fruits), cracked barley, buckwheat, millet, and brown rice. There are also two sweet-tasting dietary supplements that are virtually calorie-free have a glycemic index of 0, and are packed with other health benefits: Stevia and FOS. These supplements are not just ideal for diabetics but for anyone interested in managing erratic blood sugar levels, such as those with reactive hypoglycemia. In fact, eating the right foods can have a bigger impact on blood sugar control and lifespan than either insulin or hypoglycemic drugs, such as sulfonylureas. In a large study of insurance mortality statistics, researchers found that the mortality rate was lowest in diabetics treated by diet alone, rather than diet and hypoglycemic drugs or diet and insulin. Are Low-glycemic Foods the Anwser? The glycemic index measures the impact a food has on blood sugar levels two to three hours after ingestion. A low-glycemic food is on that has a minimal impact on blood sugar levels. The lower its glycemic index, the lower the rise in blood sugar levels a food causes. Low-glycemic foods are indispensible to diabetics. They can alsohelp pre-diabetics, borderline diabetics, and even non-diabetics avoid dangerous spikes inblood sugar that can damage cells, blood vessels, tissues, and organs. Fifteen times sweeter than sugar with no calories and a glycemic index of 0, the powdered leaf of Sterva rebaudiana has recently become highly sought after as a supersweet, low-calorie supplement throughout Asia and South America. Stevioside, a natural extract of the stevia leaf that is 300 times sweeter than sugar, has become even more popular, especially in Japan and Korea. But stevia is more than just a natural low-calorie, low glycemic, supersweet supplement. Unlike nutrient-empty synthetic sugar substitutes, stevia is loaded with vitamins and minerals, including magnesium, niacin, riboflavin, zinc, chromium, and selenium. Stevia is also one of the oldest, safest, and most highly esteemed South American herbs known, with a centuries-long history of safe use. Called yerba dulce (honey leaf) by the Guarani Indians of Paraguay, stevia has been used in native medicines and foods for hundreds of years. However, stevia was unknown outside of South America until 1899, when it was introduced to the West by Italian botanist Moises S. Bertoni, who found that "a fragment of the leaf suffices to keep the mouth sweet for hours." By 1921, stevia was being hailed by American trade commissioner George Brady as a "new sugar plant with great commercial possibilities." He was so convinced that it made "an ideal and safe sugar for diabetics," that he presented it to the United States Department of Agriculture. Stevia's role as a commercial sweetener first began to be seriously considered during the Second World War. Suffering severe sugar shortages, Great Britain began cultivating stevia as a sugar alternative under the auspices of the Royal Botanical Gardens. Unfortunately, the project was abandoned with reintroduction of cheap cane and corn sugar at the conclusion of the war. However, other countries were intrigued with the possibility of using stevia as a noncaloric sweetener and as a replacement for potentially-toxic, synthetic substitute sugars like saccharin. When Japan banned the importing of synthetic sweeteners in the 1960's, the Japanese National Institute of Health began researching both stevia and stevioside as possible natural replacements. This prompted a series of high-quality studies to examine both the safety and stability of stevia leaf extract and stevioside (the supersweet glycoside derived from stevia) in order to determine their suitability for sweetening commercial foods. All of the studies found that stevioside had no negative impact on any physical function after an extensive series of tests were conducted. The only side effect noted was a decrease in body weight (Okumura et al., 1978; Lee et al., 1979). More recent studies have found stevioside to be not only safe, but also to reduce the incidence of breast tumor and kidney damage when consumed on a long-term basis. A high-quality study conducted by Dr. Toyoda of the National Institute of Health in Japan found that even when used in doses as high as 5 percent of the diet for two years, stevioside had no side effects on laboratory rats except for a slight loss of weight, reduced risk of cancer, and an improvement in kidney function (Toyoda et al., 1997). Other researchers found that stevioside was highly stable to both heat and acid. When heated to 100�C for one hour in pHs ranging from 3 to 9, over 98 percent of the stevioside remained unchanged (Ochi, 1979; Fujita and Edahiro, 1979a). It even remained stable when heated to 100�C at a pH of 3 for 5 hours (Abe and Sonobe, 1977). In the late 1970s a consortium of large Japanese food producers began to incorporate stevioside as a noncaloric sweetener in numerous food products ranging from soy sauce to seafood. By 1979, Japan was using over 700 tons of stevia a year. During the 1980s stevioside expanded into Japanese soft drink market, eventually being used as a sweetener in Diet Coke sold in Japan. Although it was later replaced with aspartame when Coca Cola decided to standardize its sweeteners worldwide, stevioside continued to gain acceptance as a safe, noncaloric sweetener in numerous other foods in Japan. Today, 52 percent of all commercially sweetened products in Japan contain stevioside. Following Japan's lead, other countries began adopting stevia as a sweetening agent. China, Korea, Taiwan, and Israel began actively importing and producing stevia extracts for inclusion in foods. In 1994, the FDA permitted the importation and use of stevia as a dietary supplement in the United States. However, its acceptance by American consumers has been slow because the FDA does not currently permit stevia to be marketed as a food additive, only as a dietary supplement. Stevia also faces opposition by the artificial sweetener and sugar industry in the U.S. even though stevia's safety and stability have been shown in numerous studies, including a University of Chicago clinical trial (Pezutto 1985). Stevia and stevioside, however, are more than just safe, non-caloric, intensely-sweet herbal supplements. Several moden clinical studies suggest that stevia may have the ability to lower and balance blood sugar levels, support the pancreas and digestive system, protect the liver, and combat infectious microorganisms (Oviedo et al., 1971; Suzuki et al., 1977; Ishit et al., 1986; Boeckh, 1986; Alvarez, 1986). Unlike traditional sucrose based sweeteners, stevioside does not promote tooth decay, actually inhibiting the growth of Streptococcus mutans, bacteria associated with promoting tooth decay (Berry et al., 1981; Yabu et al., 1977). Several types of stevia are available, including ground stevia leaf, stevia extract, and stevioside. Of these, stevioside is the sweetest and most popular. A naturally sweet, indigestible sugar derived from chicory roots, fiuctooligosaccharides (FOS) is more than just a natural, noncaloric, low-glycemic sweetener: It is one of the most powerful prebiotics to be researched in the last decade. The subject of over 100 clinical studies, FOS is one of the best-documented natural nutrients for improving the healthy balance of bacteria in intestines and stimulating the growth of the beneficial bifidobacteria- also called "friendly flora"-that reside in the colon. How important to good health are these so-called "friendly flora" that populate our intestines? They are literally our front-line defense against invading disease-causing organisms, combating premature aging caused by the toxin-producing bacteria and fungi that reside in our intestines. 1. They produce substances that stop the growth of harmful, toxic gram-negative and positive bacteria in the intestines (Kawase 1982, Rasic 1983, Gibson and Wang 1994a&b). 2. They crowd out invasive toxin-generating microorganisms, such as Clostridia perfringens. 3. They slow down the production of damaging protein breakdown products, such as ammonia. This lowers blood ammonia levels that can be toxic to the human body (Bezkoravainy et al., 1989). 4. They produce B vitamins and folic acid (Nishizawa 1960, Liescher 1961). 5. They produce digestive enzymes, like phosphatases and lysozymes (Kawase 1982, Minagawa 1970). 6. They stimulate the immunity and spur immune attack against tumor cells (Mitsuoka 1980, Sekine et al., 1985). 7. They increase the absorption of the essential minerals magnesium and calcium. As we age, magnesium levels in the body decline, contributing to high blood pressure and diabetes. Technically a fiber rather than a sugar, FOS is totally unlike conventional sugars because it feeds the beneficial Bifidobacteria while selectively starving the parasitical yeast, fungi, and bacteria that contribute to disease. Most toxin-producing microorganisms in the intestines are unable to use FOS as food. Conventional sugars, on the artier hand, do the opposite: Sugars, like sucrose and lactose, tend to feed harmful bacteria and beneficial bacteria alike. Besides building up the beneficial bacteria in the body, FOS has also been shown to improve blood sugar control, liver function, and calcium and magnesium absorption. 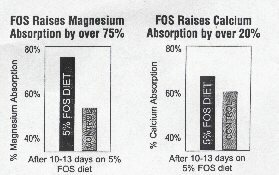 A 1997 animal study conducted at the Nutritional Research Center in Japan found that a 5 percent FOS diet increased magnesium and calcium absorption substantially. A 1998 Showa University study obtained similar results (Ohta et al., 1998, 1997, 1995; Morohashi et al., 1998). Magnesium is one of the most important nutrients we obtain from our diet, being involved in over 300 enzyme reactions in the body. As we age, magnesium levels drop, creating a deficiency that increases the risk of angina, atherosclerosis, cardiac arrhythmias, depression, and diabetes (Schauss, 1998; Jansson, 1981). A study conducted by the National Research Council of Canada showed that marginal magnesium deficiency can reduce the life span of laboratory animals by 40 percent (Heroux et al., 1977). FOS also improves liver health. A 1999 Louvain Catholic University study found that a 10 percent diet of FOS can protort against fat accumulating in the liver and lower both blood glucose and insulin levels. Because FOS is an indigestible sugar, it triggers no spikes in blood sugar levels the way sucrose and glucose do. About 40 to 60 percent as sweet as sugar, FOS is found in low quantities in many types of foods. However, to obtain just a quarter teaspoon of FOS from the diet, you would have to consume 13 bananas. 16 tomatoes, or 16 onions. Chicory roots have one of the highest amount of FOS of any plant, and most natural FOS is commercially derived from water-extraction of the roots.